June 1, 2014 – Deputy Director of Asset Building Mattias Kraemer and Business Development Coach Sabrina Haman discuss MEDA on Bay Area Focus. May 19, 2014 – Líderes comunitarios, preocupados por el acceso a la internet de estudiantes. Aunque el uso de la red es más indispensable al convertirse en herramienta de millones de personas, un sector de la población se está retrasando. Watch on Univision. Our Mission Promise Neighborhood survey of the Mission takes place 4/28-5/30. February, 2012 – To launch the passing of legislation in San Francisco to establish “Financial Aid Awareness Week” from February 6-12, the Mission Economic Development Agency, Citi and partners held a press conference on Tuesday, February 8 at City Hall. The purpose of Financial Aid Awareness Week is to heighten awareness around the availability of grants and loans for low income and first generation college students, through a program sponsored by the Citi Foundation and the Center for Economic Progress of Chicago. 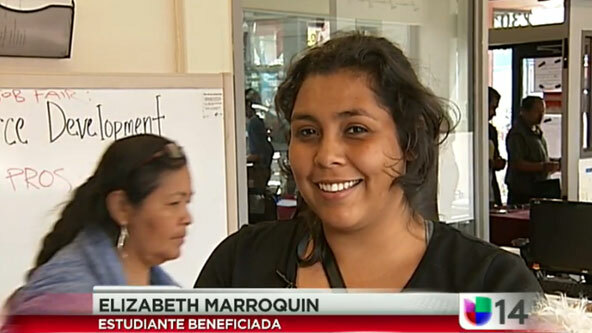 MEDA and partners are completing FAFSAs for low income students in San Francisco through this initiative. Speakers included Supervisors David Campos, Jane Kim, John Avalos and Treasurer Jose Cisneros. August, 2010 – Watch Teresa Garcia, Childcare Development Consultant for MEDA (Mission Economic Development Agency) speak about how individuals or small business owners who may not have access to business loans through traditional banks can secure funding through micro-loans.